Aksharabhyasam was conducted on 04.06.2018 for the newly entered LKG students. Swami Buddhidhanandha, Sri Ramakrishna Math graced the occasion. Additional Correspondent Sri. P. Kesavanji, SMDC Member Sri. 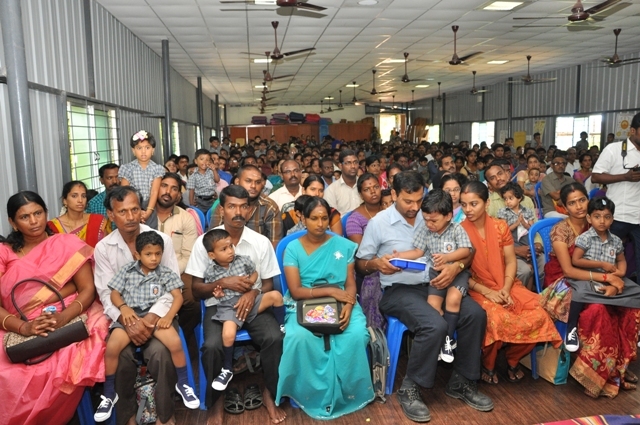 S.D.Mohanji also attended the programme. Saraswathi Pooja was performed. As the traditional way of beginning, the tiny tots were made to write “OM” on the paddy filled plates and then they were sent to the class. Aksharabhyasam, an auspicious initiation into education for the LKG students was performed on 09.06.2017(Friday) in our school premises. Swami Apavargananda Maharaj blessed the children in his benediction. 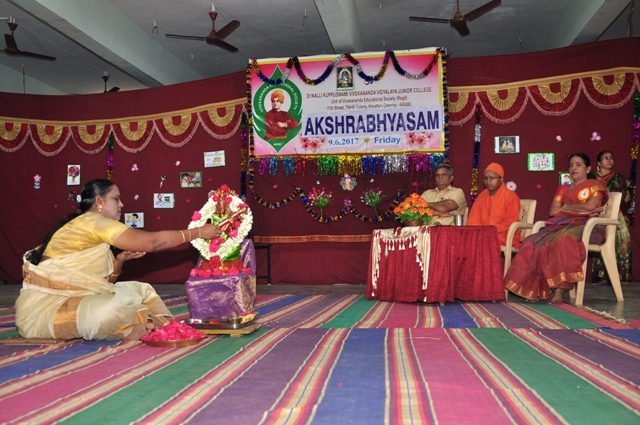 He performed Aksharabhyasam for the students. The little ones, seated on Gurus lap were guided to write 'OM' on the plate filled with paddy using the turmeric stick. 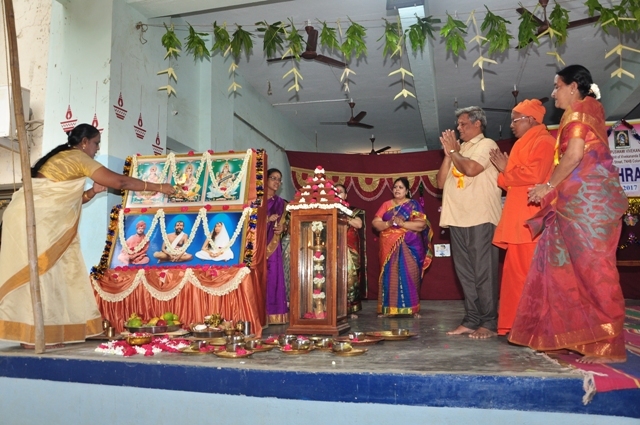 Chief Guest: Swami Apavarganandha Maharaj. 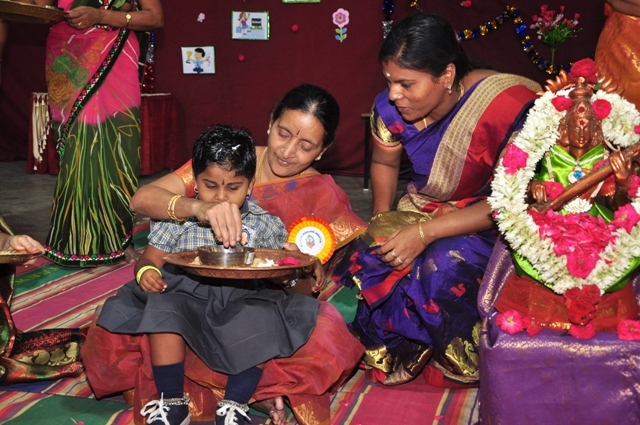 In our Hindu religion when the mind of the child is ready to receive education, a function called the Aksharabyasam or Aksharambam is performed. The word Akshara means letters and Abyasam means practice. This function is the child's first introduction to the world of reading and writing. This is believed to be a later development as compared to many other childhood functions. A traditional way of entering School by LKG kids was conducted on 9th June 2016, Swami Apavarganandha Maharaj, offered benediction. Our tiny tots were made to write OM on the paddy filled plates as a traditional start to the entrance of education. Chief Guest: Swami Buddhidhananda, Sri Ramakrishna Math,Mylapore. 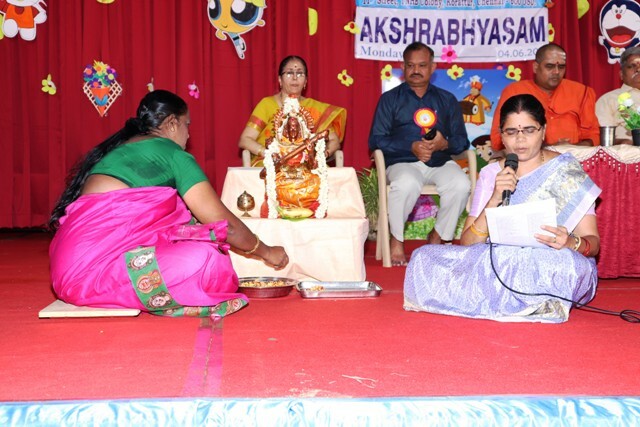 Aksharabhyasam or Vidyarambham is a traditional religious function in which the child is given initiation of education so that the child is ready to receive the formal education. In our school, Aksharabysam for LKG Students was conducted on 12th June 2015, Swami Buddhidhananda Maharaj, Sri Ramakrishna Math offered benediction. Sri. P.K. Somanathan, Treasurer, Vivekananda Educational Society also graced the occasion. Our tiny tots were made to write OM on the paddy filled plates as a traditional start to the entrance of education.